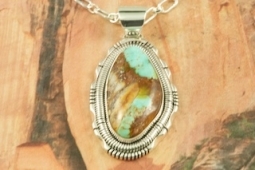 Stunning Pendant featuring Genuine Pilot Mountain Turquoise set in Sterling Silver. Free 18 inch Sterling Silver Chain with purchase of pendant. The Pilot Mountain Mine is located in western Nevada, east of the small town of Mina. Pilot Mountain turquoise forms in hard veins with color ranging from bright blue to dark blue with a greenish cast. Dark brown limonite mottled patterns are associated with this material. Most Pilot Mountain turquoise is called "grass roots", meaning the best deposits are found within ten feet of the surface. 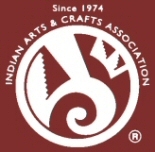 Created by Navajo Artist Walter Vandever. Signed by the artist. Pendant is 1 7/8" L including bale x 1" W.